-If a restaurant has a sign that reads “no smoking,” (don’t they all?) it’s not appropriate to light your ciggie inside and then walk through the restaurant to go outside to smoke. -Sorry y’all, but people watching in Augusta is hi-lairious. -Nothing compares to a glass of wine and time spent with a dear friend. -A glass of wine consumed during the daylight hours completely acceptable and always more fun. -FYI, if you are behaving in a way that causes suspicion, your behavior is probably suspicious. I’m just sayin’. When there’s smoke, there’s fire. If it smells like poop and looks like poop, it probably is. -While we’re being iffy, if you do screw up, own it and move on. Oh, and remember that we live in Augusta. There are no secrets. 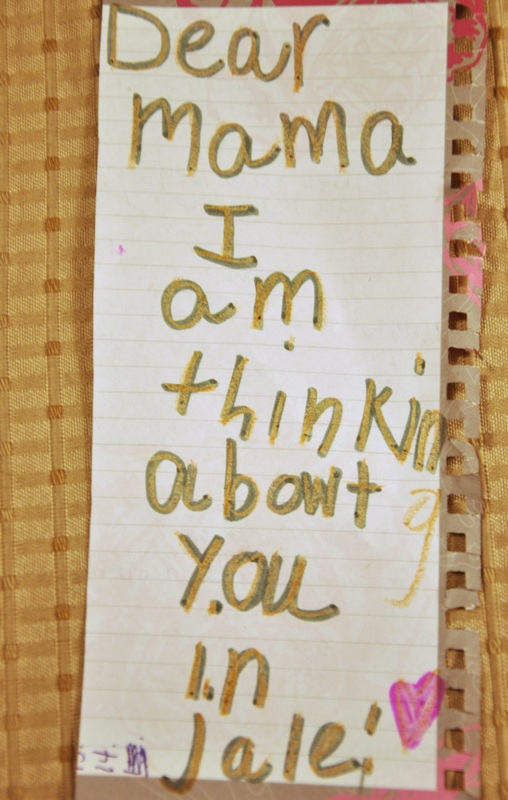 -I found a note from The Girl that said “Dear Mama, I am thinking abowt you being in jale [sic].” There is a sweet little pink heart drawn at the end. -Why on earth does she think I should be in jail? -“comparing to you, all men are nothing”(someone’s gettin’ lucky tonight), “having kids is like having 2 little drunk people” (my thoughts exactly), and “by the end of my four hour trick the weather was really lousy” (well, if your trick was that long, I’m sure the weather had changed. I’ll bet your audience jumped ship, too.) were all terms used to find my blog this week. I find these endlessly entertaining. -The warm weather, which I’m sure is about to end, is one of the main reasons we live in the south. Give me 70 and sunny any day of the year. -I have had the opportunity to go on dates with each of my two kids over the past two days. If I do say so myself, they are pretty cool little people. Annoying? Of course, but I’ll keep ‘em. The Boy actually told me that he’s more comfortable when he’s talking. I get the feeling that’s my penance. -On his ninth birthday, Patrick Chance was granted freedom from the disease that caused so much suffering. That child had more impact on those around him than most adults ever will. -It’s never easy when a child dies, no matter the circumstances. -Hug your people, and hold them close. We don’t know what tomorrow brings. ← Practice makes perfect, right?